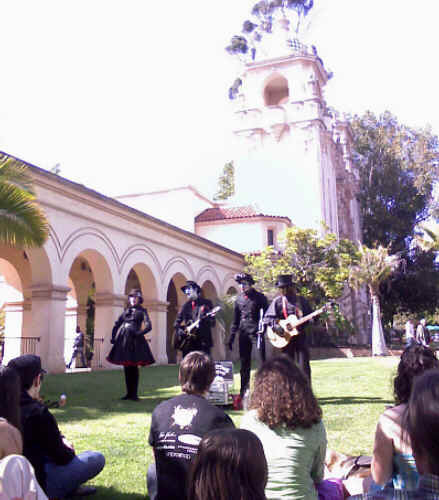 Balboa Park offers a variety of entertainment and music in the park. From concerts and musicals at the Starlight Bowl, to Street 'buskers' on the 'Prado' including musicians, magicians, jugglers, mimes on guitar, saxophone or didgeridoo, From the 'World Beat Center', along the Prado to Spanish Village. On any day of the week you can find music and a number of forms of entertainment in the park - from 'Buskers', street entertainers on the Prado, including music from guitar to violin to steel drums, to face painters, magicians, jugglers or even belly dancers! Seasonally you can find music on a Summer evening at the Spreckel's Organ Pavilion for the 'Twilight in the Park' series of concerts held on Tuesday, Wednesday and Thursday evenings from 6:15-7:15PM. Additionally, on Monday evening there are organ concerts at 7pm, sponsored by www.spreckelsorgan.org.